As I’m writing this post, my family is downstairs preparing to celebrate the New Year by watching the festivities in New York City. It’s bitter cold this year, with temperatures below freezing, so I’m glad we’re safe and warm inside. Although I’ve asked my five-year-old and his cousin to play somewhere other than where I’m writing, they’ve insisted that where I am now is their house and that it is in desperate need of decoration with all the blankets and pillows in the house. Lots of loud yelling and the playing of random musical instruments directly in my ear accompanies their shenanigans. Despite this, I keep typing, keep trying to focus in the midst of the jocularity and imaginative play swirling around me. I have to ask them several times to stop leaning on my arms and jumping on my head as I type because I need two hands and my brain to finish this before midnight. This quote by T.S. 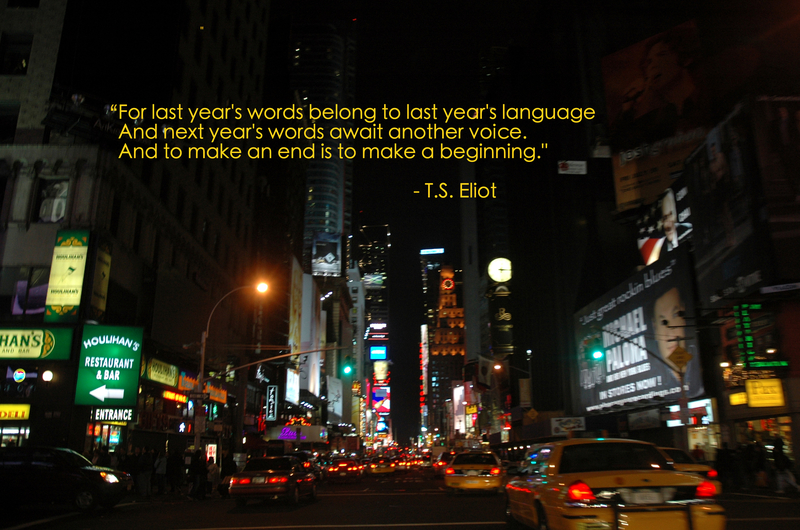 Eliot about last year’s words belonging to last year’s language while next year’s words await another voice seems like a great one to explore on the last day of 2014. If you follow me on Twitter, you know I’m struggling through a tough patch in my work in progress. In despair I gave up for a few weeks to get perspective on what I was writing. But in that ending was a new beginning. I stopped and re-read everything I had written and found that the story was holding together but definitely needs a good paring down and tightening up. Last year’s words belong to last year’s language. Next year’s words await another voice. This idea of a new year and making resolutions on the night before January 1st has always seemed kind of silly to me. Since it is always NOW, the best time to make a change is now. The past is already gone the moment we bring our awareness to it and the future is constantly being created in what we do now. One of the beautiful things about Time is that it cannot be wasted in advance. The next year, the next hour, the next minute are waiting for you as if you had never procrastinated too much on Twitter or Facebook, drank one too many glasses of wine, made one too many trips to the fridge, or sighed and shut the computer down instead of finishing your next sentence, chapter or story. These unsullied moments are there waiting for you to turn over a new leaf, hourly, if you choose to do so. Endings can happen at any time, making way for new beginnings. I urge you to use your other voices and next year’s words in a powerful way. With each moment that you don’t do something you say you want to do, remember you can also, in a moment, decide to do it as well. I’m looking forward to reading what you write in 2015. Stories are the Wildest Things! I often find myself holding back as I’m working on a book because I’m afraid that I’m going to run out of ideas. This is a ridiculous thought. Ideas are infinite. Some people, like Elizabeth Gilbert, author of Eat, Pray, Love, even think our ideas don’t come from us, they pass us through us and, if we’re lucky, we’re able to grab them on the way past. Here’s Annie (and friends) giving it her all as a karaoke singer in Key West. I also like this quote because this is the season of giving. I love giving and receiving gifts as much as the next person. But I know that around this time of year we can put a lot of pressure on ourselves to get the PERFECT gift. We sweat and fume over what gift to give to those we love. We wander the aisles, in real life or online, running our fingers, real or cyber, over the merchandise on those overstocked and bulging shelves. We seem to pursue that perfect gift to have a transcendent experience with the person the gift is intended for. As we pick up the object we look into the future and see the hoped-for response in the receiver of the gift. Maybe we want them to weep in happiness or jump up and down for joy or finally see how much we really, truly understand them by our choice of a gift. In the past, I’ve felt the painful disappointment of giving a gift that was received with less enthusiasm and joy than I had imagined. Excited for the holidays, I kept a joyous anticipation of the look on my children’s faces when they would open their gifts. Then when the big day came and the gifts were opened and almost immediately abandoned, I’d feel a sad lump in the pit of my stomach as I realized I hadn’t achieved gift-giving nirvana once again. Because we could just as easily paint rocks in pretty colors and give them to each other if that was our tradition of gift-giving. But even if that was our tradition, people would still be disappointed because the rock they gave wasn’t purple enough or red enough or orange enough or shiny enough or big enough or small enough or new enough or whatever enough quality they were looking for in the gift because it’s not about the gift. This holiday season try not to project the perfect response on to the receiver of the gift. Allow what happens to happen and be there for it fully. Maybe their eyes will twinkle for a millisecond. Perhaps they’ll sigh because they have a hundred of the same thing at home. They might even drop the gift on the ground and jump gleefully into the box it came in, playing with the box for hours. By allowing their response to the gift to be what it is, you have a chance to remember that a gift is just a stand-in for the time and attention you want to spend with that person now. If you waste that time worrying about what they thought of your gift, you’re missing out on being with them fully as they are. This slight change of thinking has made for much happier holidays for me and my family. I no longer put tremendous pressure on myself to come up with just the RIGHT gift for those I love. Now I try to give my time, my love, and my attention. The object wrapped in shiny paper can never equal that in value. If you are looking for gifts for the writers in your life (including yourself), please stop by and order something from The Writer’s Retreat. There’s some great books on writing, writer t-shirts, writing supplies, Poe air fresheners and more. Check it out by clicking this link: THE WRITER’S RETREAT. 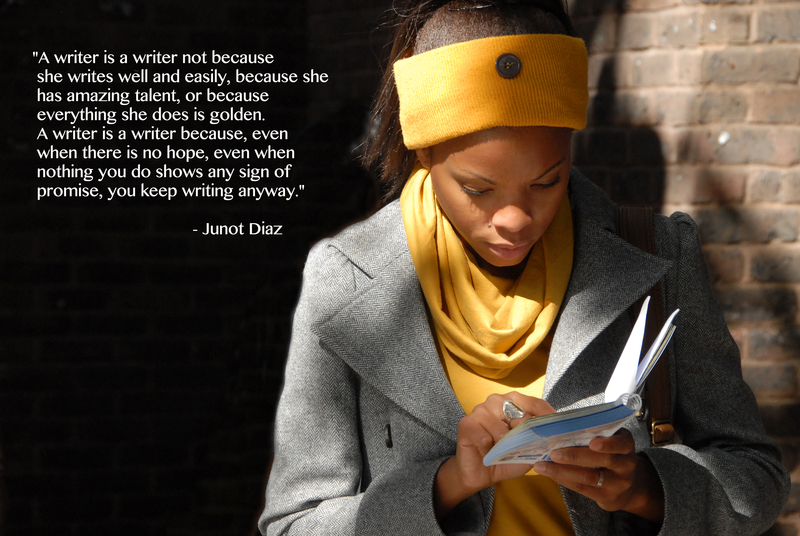 He also runs a writing workshop for writers of color called “Voices of our Nation Workshop”. With events around the country that still reflect our nation’s dire need to address racism, I think it’s important that we support organizations like VONA. Their mission is to bring together a community of writers of color from the margins to a place where it is centralized and honored. Melinda D. Anderson quoted on Twitter today that “If racism is lodged in white perceptions, one answer might lie in diverse children’s literature.” I think she’s on to something important. She’s quoting an article by Noah Berlatsky in PSMag.com. He says that of the 2,300 children’s books published in 2013, only 67 of those were written by African American writers and only 93 had central black characters. According to the article, that’s the lowest tally since 1994. I’ll let you read the article by clicking the link, but the theory Berlatsky brings up and Anderson supports is that we need diverse literature not just for children of color but for white children, too. By reading about diverse protagonists, there may be a reduction in racial anxiety which could, in turn, reduce implicit racism. One of the ways of reducing racial anxiety is by having positive, inter-racial interactions. Books can do that for us as well! When people read about or engage in media with diverse protagonists, their racial anxiety is decreased through counter-stereotyping. I think this is an important and vital issue that all of us who tell stories should be examining and supporting. Let me know in the comments if you are working on or reading diverse literature and the effect it has had on you. If you are taking part in the protests, stay safe, stand tall. Black lives matter. We need diverse books.